Q. How happy are you after this tournament? 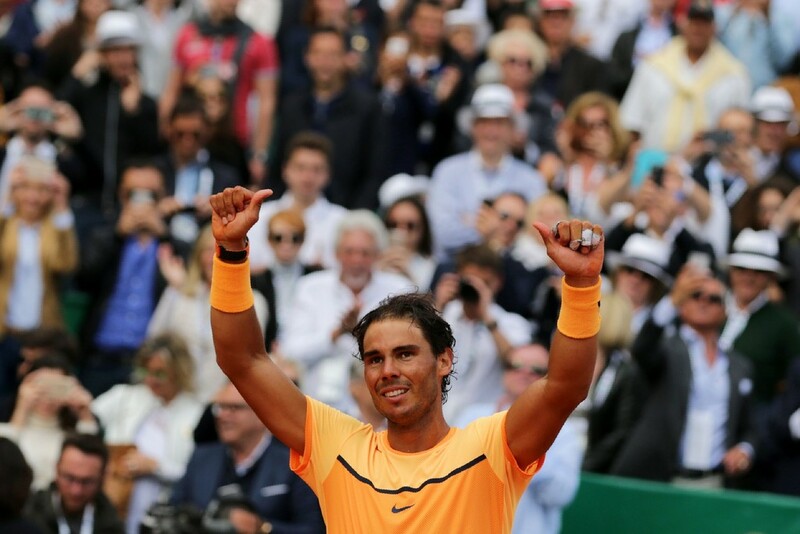 RAFAEL NADAL: Have been a very important week for me. Is obvious, I say at the beginning of the season, I feel myself much better than the year before. The victory here confirms that I am better and I am very happy, no? Is very, very emotional week for me, very important event. Probably Monte-Carlo is one of the most important places in my career without any doubt. Win again here after three years is something so special for me. So very happy for that. Q. Does it seem like a long time, almost two years since Madrid, the last time you won a Masters 1000? RAFAEL NADAL: Yeah, I have been a couple of time without having sometime without winning big, big tournament. I enjoying this moment, no? I know I worked hard to have this trophy with me. I am enjoying this moment. Is emotional moment after some tough moments. But that’s part of the life, is part of the sports in general. Very happy today. I hope and I believe that this week, Indian Wells, this week, two tournaments in a row, playing at a very high level, I think that’s so important. That’s what I needed. I said the first day when I arrived here in the first press conference that I needed matches in a row, I need weeks in a row competing at the highest level. I already have two weeks in a row competing at the highest level. Today winning nine times here is something unbelievable for me. Outside of that, that is something so special. Compete well two weeks in a row is something so positive. Another chance next week in Barcelona, I going to try my best again. Q. How did you manage to suddenly go up another level in the third set? Suddenly you went away from him. RAFAEL NADAL: The conditions today were much slower than during the whole week. Not sun. The court was heavier, so the balls are heavier. Little bit tough conditions, no? For me is better to play with a little bit faster conditions. But even like this, was a final against a player that is so quick and covers so good the court. He’s playing well. He’s playing much more serious during the whole match. Before he was able to play unbelievable moments, but then having mistakes. It’s not the case now. He’s playing solid all the time. So when I finished the second set, I was telling me, Okay, something is not going well because the match is not in my hands. The match is not in his hands, but is not in my hands either. I need to do something else. I need to hit more with my forehand. That’s what I was telling to myself. I need to go more for the shots with my forehand, I need to play more inside the court with my forehand. If I lose, I lose, but I have to take that position. I have to decide the match with my forehand. Missing or winning, but I need to do it. I did. It’s obvious that it worked so well in the third, increasing a little bit the level of my tennis, level of my forehand. That changed everything. Q. Your 14th match with Gael. Were you surprised in any way by what you came up with today or was it just a matter of you raising your game in the third? So many breakpoints. RAFAEL NADAL: He won all the matches so easy this week. When somebody is winning easy is because is playing so good. That’s the real thing, no? And Gael, everybody knows the potential of Gael. Is obvious that Gael is a little bit up and down during his career. But everybody knows his potential is so high because he has everything to play at the highest level: good serve, movements are unbelievable, super quick, he has all the shots. If he’s able to play solid, he’s one of the toughest opponents you can face. The third set, after a super long two first sets, was a tough set for both of us. I was able to increase little bit the level of intensity, the level of tennis in general. That’s why I have the trophy with me. But Gael was playing great. He’s playing well since the beginning of the season. He’s in a very high position in the race. That’s difficult. I think he’s No. 5 in the race now. It’s something great. Q. During your speech you said you had to work especially hard to get back at the level you are now. Can you share maybe what was the most important part of the work you’ve done in previous weeks or months to get back to this level? RAFAEL NADAL: I have been working hard. I have been working hard since long time ago. Last year have been a tough year in terms — I don’t want to talk anymore, I said enough about the nerves, I was nervous during the matches. Is work every day to slow down that, no? Is not going like this, going like this (indicating up and down). It’s not something that stays here and disappears. It’s the work of every day. The victories help. Still not 100% perfect, but still is much, much better of everything. I don’t have that feeling I had last year on court. Very happy for that. In terms of tennis, I am playing better. It’s obvious. I was able to raise the level, increase my level yesterday in the second and in the third, and today again in the third. That’s something I missed a lot the last period of time. Before when the match was coming tough, I was able to increase. This week I was able to do it. Q. After Australia, what was your feeling? Did you think you could recover the high level of tennis? RAFAEL NADAL: The real thing is I was playing great in Australia. I was playing great before Australia. It was a big lose for me in Australia, that’s the real thing. So tough one. I had to accept and come back. I did. I put me in a position to play well in Indian Wells. I was ready to play well in Miami, but had that accident. Here again continues well. I need to keep going. Very positive week. Next week is another tournament and I need to be ready. Q. How important is this victory for the future, for your confidence? RAFAEL NADAL: We’ll see. We’ll see in the next six months. For the moment is a day to enjoy. Is a so important victory for me. I have to enjoy this moment. Tomorrow I start to think about Barcelona. Is another important event for me. Q. Before you say you like faster surfaces. Monfils before said that he didn’t have many free points on his serve because the court was slow, the balls were slow. Do you really think the court favored him or you, or changed completely the match? Many breakpoints. RAFAEL NADAL: On clay there is usually more breakpoints than on hard. That’s the real thing. Especially when you play in slow conditions, the serve lose a little bit the effect, no? I don’t know, but for sure for him is probably better to play in faster conditions. But is obvious that if I was playing in faster conditions, my ball would be higher bounces, the topspin will be higher. So for him at the same time probably he will have more free points with the serve, but will have less chances to come back from that tough positions all the time. King with great attitude ! congrats For 9th MC title. very happy for you. You need to play like the third set all the time, take risk and play inside the court. staying too far from the baseline and playing too defensive game may results in some wins but it drains your energy and can’t be sustained for a long time. you need to hire a new coach to help you with more aggressive game plan and better serves. I want to see you raise the 10th RG trophy and beat Djoker.